Australian WIA AR magazine - features SOTA on front cover! Front cover is Nick VK3ANL activating Mt Beckworth VK3/VC-024 in January. 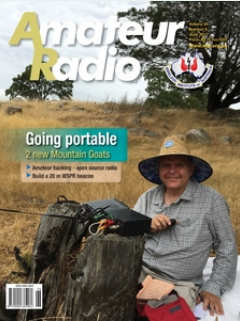 The magazine has the story of Compton VK2HRX and Nick VK3ANL achieving SOTA Mountain Goat. It was a nice surprise to see it. I supplied the photo, but not expecting it to go to cover. Forest Gump still has the lead over me though. IIRC he was on the cover of Fortune magazine, twice. Well Done & 73 Ed DD5LP/VK2JI.